Pettiquette for Non-Pet Owners Series. Article 1. This series is a guide for non-pet owners. 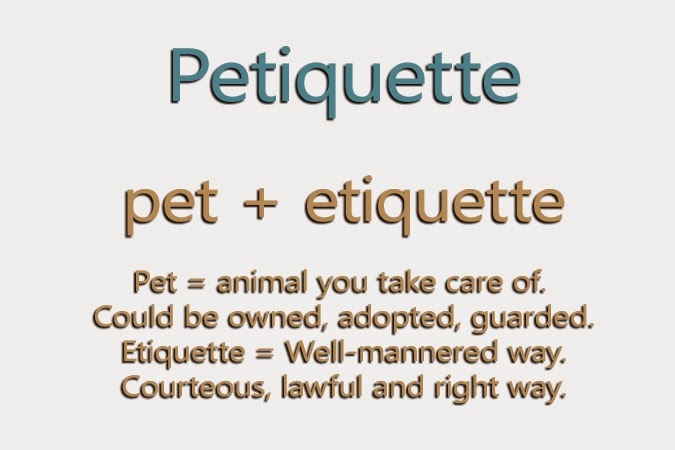 Proper Petiquette should apply not only to those with pet but also to those without pets who come into contact with pets. Pet parties are all the rage nowadays. You might just get invited to one. If you are uncomfortable attending a party with animals, say so. When they ask to RSVP, respond please. Pet parents giving a pet party is a way for them to celebrate their time and love for their pets. It’s just proper etiquette to accept or decline with grace. If you accept, they will be expecting you. Food is usually counted because they have to prepare for two sets, one for humans and another for pets. Some even prepare for three sets, adults, children and pets. If you are bringing others with you, tell your host. Since it is a pet party, ask for the theme. Dress accordingly and bring a gift. For pets celebrating their first year of age, you usually give useful things like teething toys, plushies, blankets and training tools. For older pets, it’s nice to give chewable rawhides, rope toys and the like. Don’t give garment unless you know the size and preference of the pet. In giving treats, if you don’t know the dietary restrictions, better to stick to toys. If you are close to the owners and know that they don’t mind, gift them with used towels. They could use it under the pet bed or convert it into toys or rug. Things to also consider giving are fruits and veggies. Apples and carrots are the safest. Arrange them in a basket or wrapped well in ribbons. Safest things for gifts are colorful leash, pet toys, blankets, and gift certificates. Price is not an issue when giving. You must not equate cash value to what you expect the party to be. The fact that you are invited means your host thought about you. Giving a gift is just a way of saying thank you. Upon leaving the party, thank your host and with their pets well. Enjoyed yourself or not, it is good manners to say thank you for thinking about them and taking time to invite them. If you noticed you are one of the last ones to leave, offer to help clean up. Even if it’s just picking up paper hats, bottles and putting away dishes.